This is Thrustmaster's complete solution for all sim flight enthusiasts: control of all cockpit elements! With the Thrustmaster T.16000M FCS Flight Pack, Thrustmaster has devoted its 25 years of expertise in flight sim controllers to meet the growing demand from flight simmers in general – and space simmers in particular. Experience how realistic flying at home can be with this very complete set! Combined with a Playseat® Air Force, it will feel like you're in a real cockpit, ready to land a Boeing in a storm or engage in an epic space battle! The T.16000M FCS Flight Pack has been designed for advanced fliers looking for comprehensive, realistic controls as an alternative to using a mouse and keyboard. It is composed of the T.16000M FCS (Flight Control System) flight stick, the TWCS (Thrustmaster Weapon Control System) throttle and the TFRP (Thrustmaster Flight Rudder Pedals). The T.16000M FCS Flight Pack is compatible with PC via USB in Windows 10, 8, 7 and Vista (32-bit and 64-bit). In order to guarantee exclusive high-precision performance, pitch and roll on the T.16000M FCS flight stick employ H.E.A.R.T HallEffect AccuRate Technology (U.S. patent US08471815) for 16-bit resolution (i.e. 16000 x 16000 values) – the same pinpoint accuracy delivered by the extremely high-end HOTAS Warthog joystick, allowing gamers to engage their enemies with surgical precision. The helical spring (0.1” / 2.8 mm in diameter) inside the stick provides firm, linear and smooth tension. S.M.A.R.T (Sliding Motion Advanced Rail Tracks) technology: a unique system of slide rails for perfectly smooth throttle sliding motion and precision. The TWCS throttle’s lower positioning compared to quadrant-based systems provides unrivalled comfort along its entire 3.2 inch/80 mm range of travel, for smooth and accurate control. The tightening screw allows users to adjust the throttle’s friction level to suit their own personal taste. These products are part of a range of flight simulation peripherals that can be used in conjunction with one another: a complete ecosystem featuring the FCS flight stick, TWCS throttle, TFRP rudder pedals and MFD (Multi-Functional Display) cockpit panels. These elements are also compatible with the T.A.R.G.E.T advanced programming software. Thrustmaster Advanced pRogramming Graphical EdiTor software: combine with other Thrustmaster devices (so that they are recognized as a single USB device), and load or create specific mapping profiles for each game. Tailor your own profiles to enhance most Thrustmaster flight controllers, and share them with the Thrustmaster community. Thanks to its design and ergonomics, the T.16000M FSC Flight Pack provides players with multiple recognizable features, allowing them to become more effective and accurate when in flight. This enhanced access to flight controls proves even more essential when players are fully immersed in the exceptional flight experience delivered by VR-compatible games. 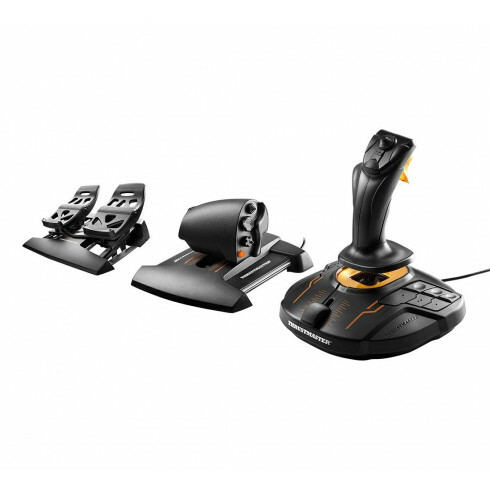 Combined with a Playseat® Air Force flight simulator, you have the ultimate flight sim setup! Intuitive and natural: feels just like sitting in the cockpit!